Any ergonomics intervention must be viewed in light of its effect on productivity, and the best ergonomics solutions will often improve productivity. Many companies have heard about the cost savings associated with preventing musculoskeletal disorders (MSDs) in the work place. The savings these companies have most likely heard about have been focused on reduced workers’ compensation claims, lower insurance premiums, less employee turnover, and possibly avoiding regulatory fines. 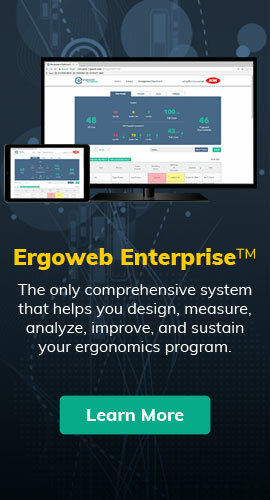 What some companies haven’t heard is that improving ergonomics almost always can improve a company’s productivity. Any ergonomics intervention must be viewed in light of its effect on productivity, and the best ergonomics solutions will often improve productivity. Simply put, reducing unnecessary or awkward postures and exertions almost necessarily reduces the time it takes to complete a given task, thus improving productivity. Body motions, visibility, workload, and other important ergonomic parameters will also affect the quality of work, and the quality of work product. When a task is matched with the ability of the people that will perform it, they will make fewer errors and produce less waste. Ergonomic design considerations have also been shown to influence employee recruitment and retention. The following table shows examples of successful performance approaches. When calculating ergonomics into equations at your workplace, don’t forget to look at possible productivity gains. This may be just the information needed to convince a manager or team member that good ergonomics is definitely what you’re looking for. An excerpt from Ergoweb’s Applied Workplace Ergonomics Manual.